For close to a century, High Hampton Inn & Country Club, surrounded by the eternal beauty of the Blue Ridge Mountains in Cashiers, has been hosting generation-after-generation of golfers and vacationers who return to rejuvenate their souls and reconnect amidst the 1,400-acre playground. This rustic resort is, arguably, one of America’s top country inns, but the traditional, non-flashy nature of the place also inspires detractors. Describing the High Hampton Inn is a lot like trying to describe the Mona Lisa — some see unmistakable beauty while others see a girl with an awkward smile. What began as Gen. Wade Hampton’s retreat in the 1830s continues as a haven today, almost 180 years later. Guests find relief from the hustle and bustle of everyday life while vacationing at the Inn. There is no air conditioning, the cool mountain breezes continue to blow and refresh just as they have since the beginning of time. The lodge and rooms are made of rough cut timber. There are no phones or TVs in the rooms. This is where plush is out and old world is vogue. It resembles a summer camp designed for the entire family. The Inn provides a refreshing vacation where very little changes except the seasons. 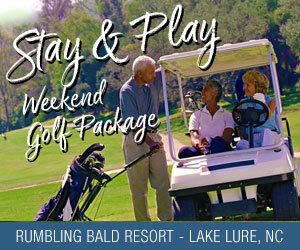 The resort features an 18-hole golf course with bentgrass greens and fairways. One of the nation’s more spectacular holes is No. 8, which virtually sits in the middle of a 35-acre lake. The course is not built to challenge the low handicap player but is designed to take the family or a new golfer for an enjoyable round of mountain golf, and maybe inspire them to play golf for a lifetime. Looking for a few water activities: swim, canoe or fish in the crystal clear lake. This is old school — no modern cement ponds. However, the last few years Bill McKee, descendent of the original owners, has added a few upgrades. All the rooms have been renovated with new bedding and bath fixtures, wireless Internet has been added to the lobby and a grand spa has been added across the street from the Inn. The new spa features a modern fitness facility along with a wide variety of treatments. Another new change is fly-fishing instruction by famed instructor Alex Bell. Bell is noted for starting the Western North Carolina Fly Fishing Trail. No need to know which end of the rod to hold. Bell will calmly walk you through the process and simplify the use of a fly rod in a pond along the 18th hole. Decide you are ready to tackle local streams or rivers and many of the best trout waters are close by. Bell is available to lead you on those excursions. Parents have the option of entering their kids in the popular kids programs for supervised activities in case parents plan on going white-water rafting on the Nantahala River or enjoy a morning tennis match. Southern tradition consumes the place — from the buffet dining room that continues to provide traditional High Hampton fare, such as fried chicken, fresh mountain trout and great desserts — to the bingo in the parlor after dinner. High Hampton is recommended as a place to reunite with the family and reconnect without the distractions that consume our everyday lives.